Mobile Kitchen Brings 5-Star Chef to You! 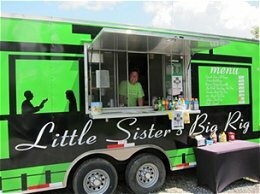 Little Sister’s Big Rig is a locally owned mobile kitchen, located at the Kinzua Bridge State Park in Mt. Jewett, Pennsylvania, during the spring, summer & fall, which will travel to cater for special events, fairs and festivals. Their goal is to use the best local ingredients to bring you big flavors which won’t break the bank. Try their Kinzua Beef Burger – 8 ounces of fresh beef, grilled to juicy perfection, topped with cheddar cheese and served with fries on the side. 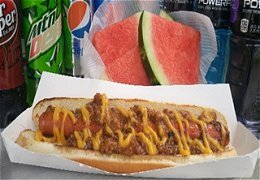 Other favorites include the Skywalk Foot Long hot dog and the Route 6 Chicken Quesadilla. Little Sister’s Big Rig is available to cater weddings, graduations, birthday parties, funerals, business meetings, and holiday parties. Let Chef Chrissy put her 5-star experience to work for you to make your day extraordinary. She will work with you to create a custom menu that suits your style and culinary preferences.